All Time Low is an American pop punk band from Baltimore, Maryland, formed in 2003. 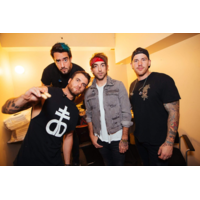 The band consists of vocalist and rhythm guitarist Alexander Gaskarth, lead guitarist and backing vocalist Jack Barakat, bassist and back vocalist Zachary Merrick, and drummer Rian Dawson. The band's name is taken from lyrics in the song "Head on Collision" by New Found Glory. Formed while still in high school, All Time Low started out covering pop punk bands such as Green Day. They signed their first record deal with Emerald Moon Records in 2004 and released their first EP, titled The Three Words to Remember in Dealing with the End later that year. Their first studio album, The Party Scene, was released July 2005. Before graduating high school in 2006, they signed a record deal with Hopeless Records and re-recorded songs from their debut album and included two new songs for their EP Put Up or Shut Up. The EP entered both the Independent Albums and Top Heatseekers charts. In 2007, All Time Low released So Wrong, It's Right, which entered the Billboard 200 at number 62. The band was eventually selected as Alternative Press Magazine's Band of the Year for 2008. Their third album Nothing Personal was released in July 2009, debuting at number four on the Billboard 200.